Some days the pictures just tell the story. No reds and pinks but the sunsets are pretty amazing none the less. 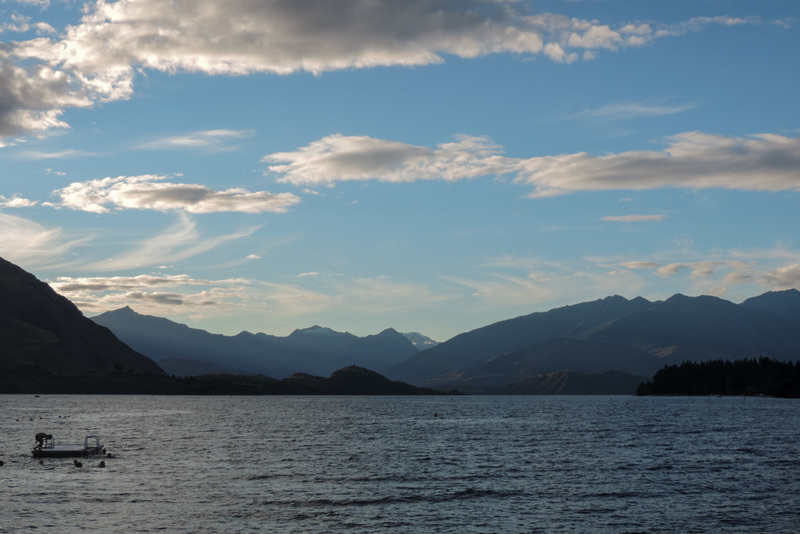 What does it say about my that I cannot stop taking picture of lake Wanaka? I think I could feel quite at home here, and it’s not just the great beer at the happy hour pub. After the said pub I went to lake front and waited for sunset, there were no “out of the world colours” but the sky was nice, the lake was stunning and everybody was just chilling out. Everybody, but the birds, and they are pretty scary as well as totally fearless. 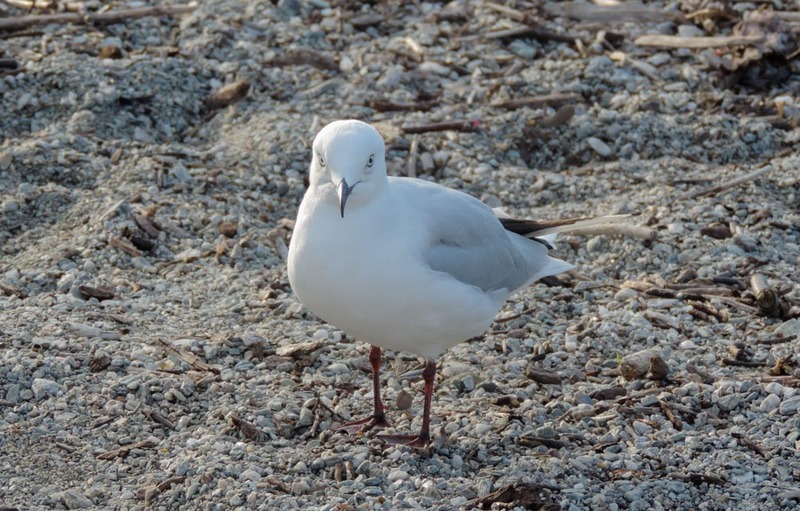 He looked like he was sizing me up. Even after I slept I could not help myself and went down to the lake front to have breakfast. That lake front is going to be one of the memories of this trip, shame I had to see it on my own like all the other wonderful things I have seen so far. The secret to a perfect breakfast i the location. 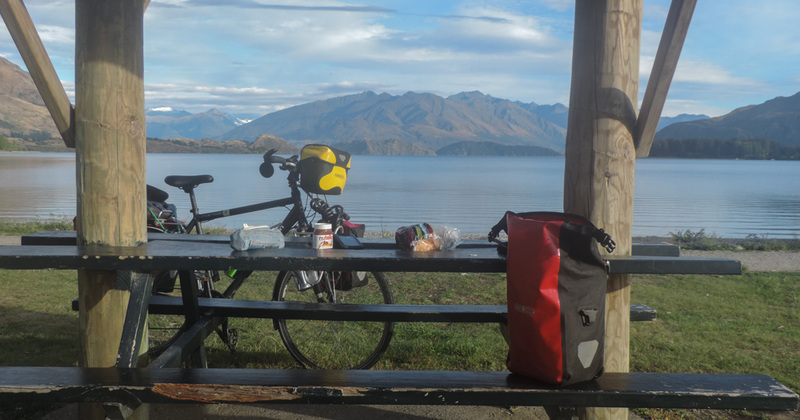 Said bye bye to the lake and the town I was now heading south for Queenstown going through the Crown Range Road. 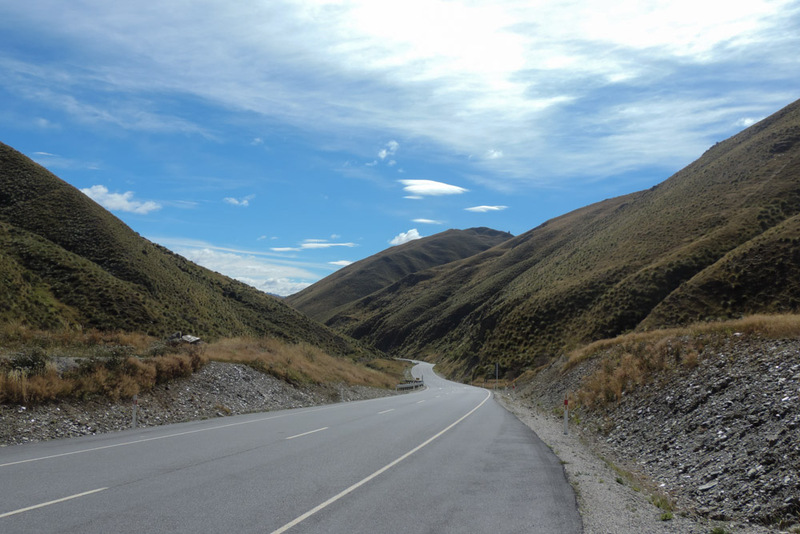 This route is an alternative to the SH6 which I have followed almost religiously throughout the west coast and it involves one single massive hill. 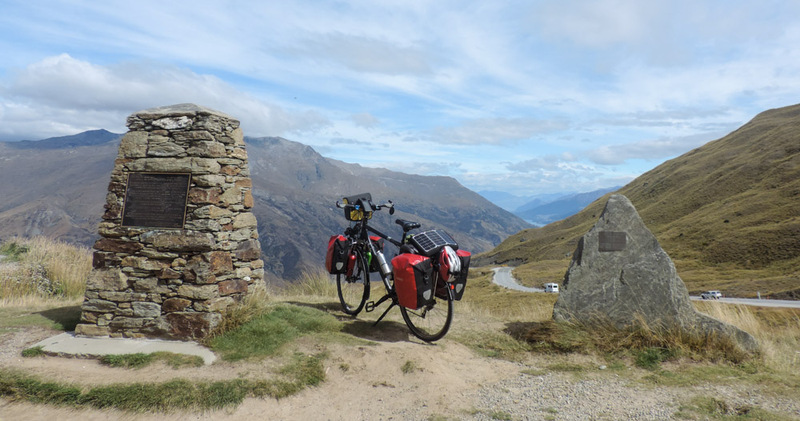 Rather differently to what I have encountered before this time it’s going to be more like a European experience, with a rather long ascent followed by a rather long descent, none of this crippling up and down to which I have now become accustomed. It was all going very well, the gradient was acceptable and the road was nice, the sun even came out one hour into the ride. This is just the Campsie. 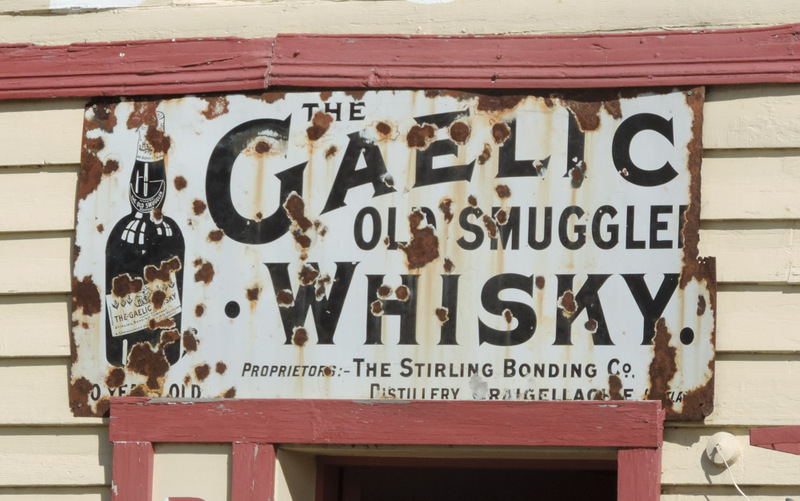 It is quite spooky how much of Scotland I see in the south island. Apart from the morphology which is rather reminiscent of the highlands, creeks appear to have now quite consistently given way to burns. 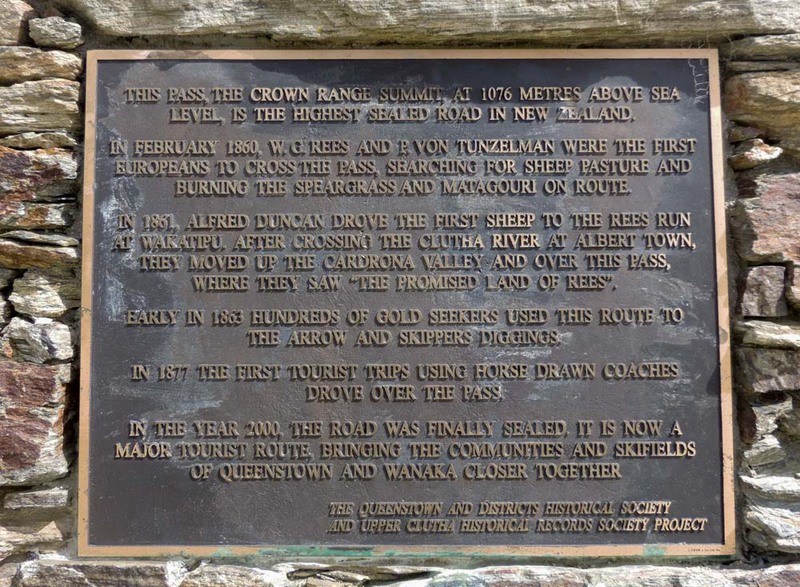 This was also underlined in the first outpost that I hit, Cardrona. It has it’s own monolith. 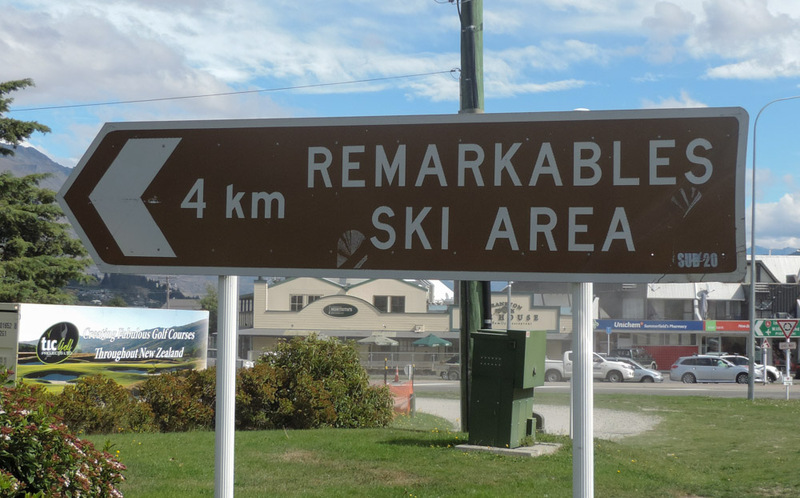 Cardrona is a ski resort and, naturally, in the summer it recycles itself as an “anything else” destination. 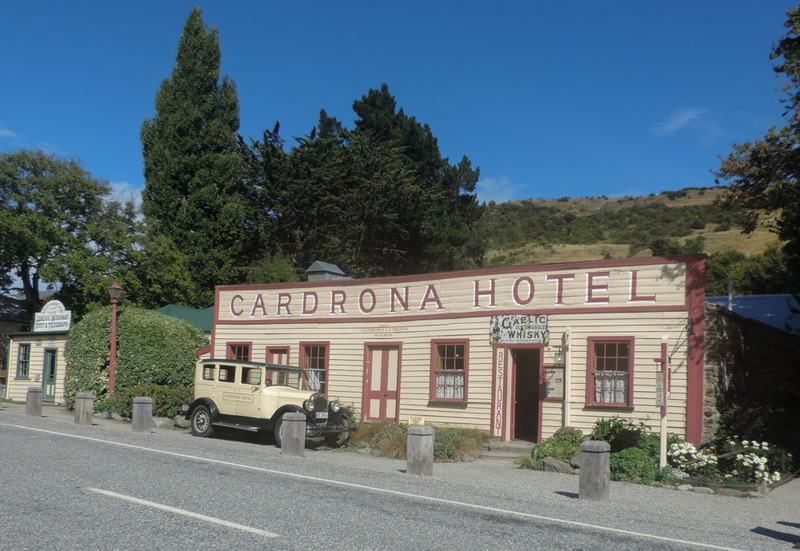 As part of that there is the lovely Cardrona Hotel which serves a mean carrot cake and the best flat white I’ve had so far. While the front has a rather gone by age look, the back of the hotel has a lovely garden where I sat and had pleasant conversation with a couple of kiwi that enquired about my solar panel. 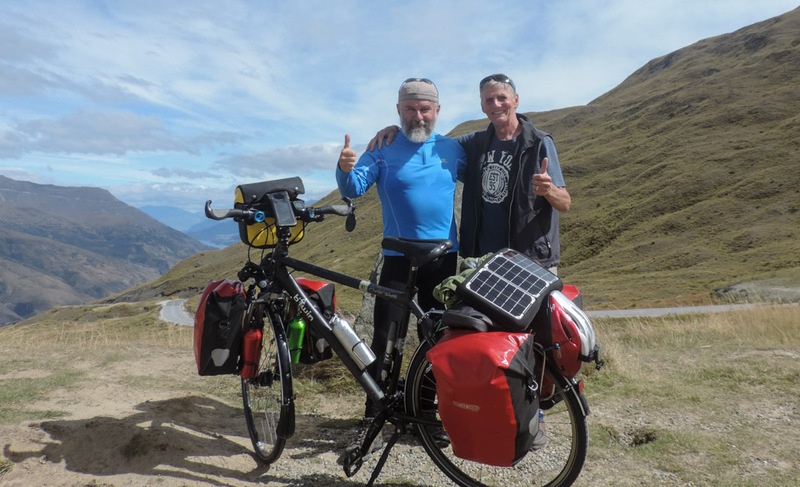 One of the things I have always failed to mention is that the solar pannel at the back of the bike is the single most importan conversation starter in my arsenal. If I had a penny… , as they say. You’d almost want to see Penelope Pitstop come out of the joint. The nice couple gave some tips on the road past the pass, it is apparently quite fast and with very tight bends, people know it, they said, but there are a lot of foreign drivers that re not as prudent as the locals. 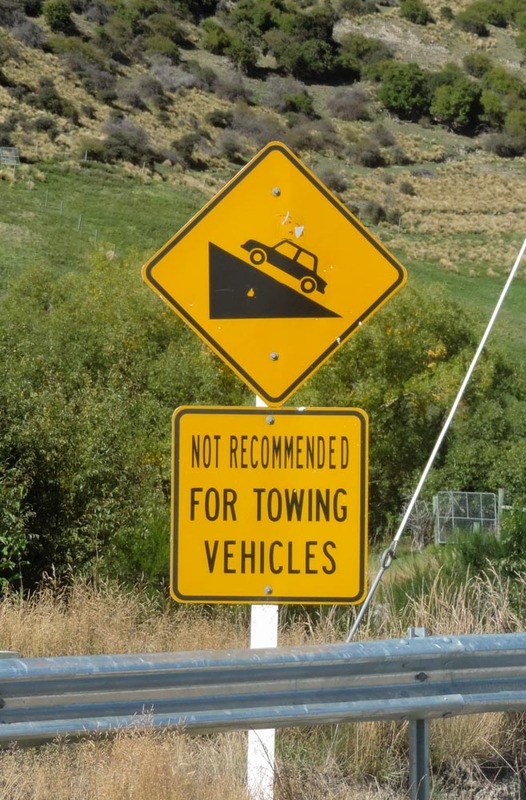 My least favourite sign again, with a twist. I did a bit of mapping while I was in the garden bar and I discovered that I was only 9 miles from the summit. Talking to Tanya yesterday, I discovered that only the last two miles or so of the hill were really fierce and with this in mind I got going, paying minor attention to all the terror spread by the road signs. Right enough the first 7 miles after the stop went fairly quickly but I then came to the wall. 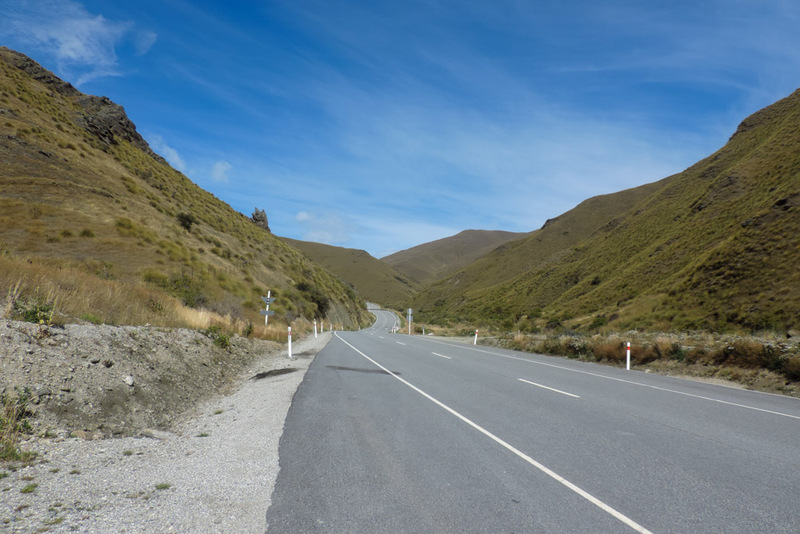 I am not sure why but 2D photography just does not convey at all the gradients of roads. The two pictures above were taken in one of the several stops I made in those infamous two miles. While I was putting the camera away I spotted on the other side of the road, rapidly approaching me, as he was going downhill another cycle tourist. I also noticed his bike and I quickly waved at him to stop and come to chat. The reason for my interest was that he was riding a folding bike and I wanted to ask him questions about his experience and how he found it under load. 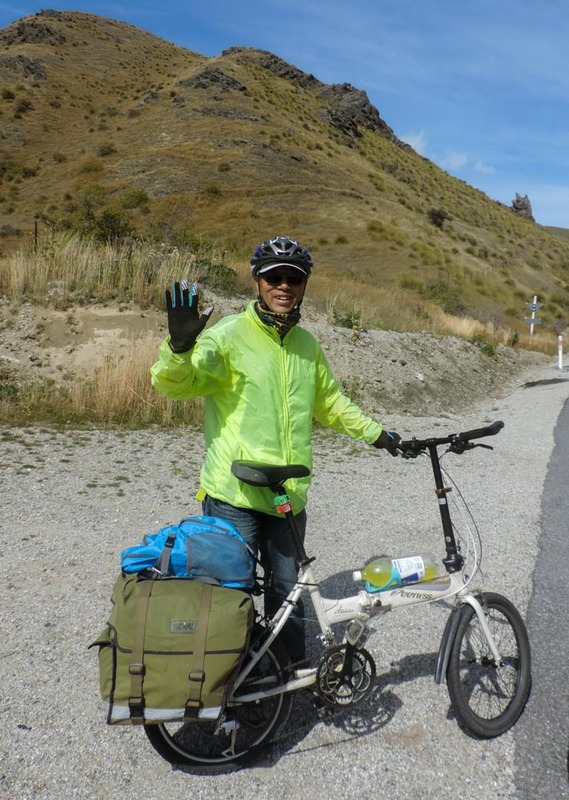 It quickly transpired that this chap knew very little english and beyond wanting to take a picture with me and taking a few pictures of my bike, including the solar panels, I got out of him only that he was from mainland China. Still it is good to get one’s idea validated in the field. I know it’s not a Brompton but I guess some people use folding bikes to do what I do. It was back to the grind and in another short 20 minutes I was at the top. There I was greeted by a round of applause and congratulations from a cool Melbourne chap that stopped and had a chat with me. He’s a cyclist too and we packed in a small space of time a great deal of cycle talk. Little I knew I’d be seeing him and his wife again at the camp later on. His wife took a picture of us and then they left me to take another few while at the same time recovering my breath for what was going to be a long and exilerating descent into Queenstown. And by the way the one down there is Queesntown. The first part of the descent was really steep and then there was a little flat area with a nice lookout point. 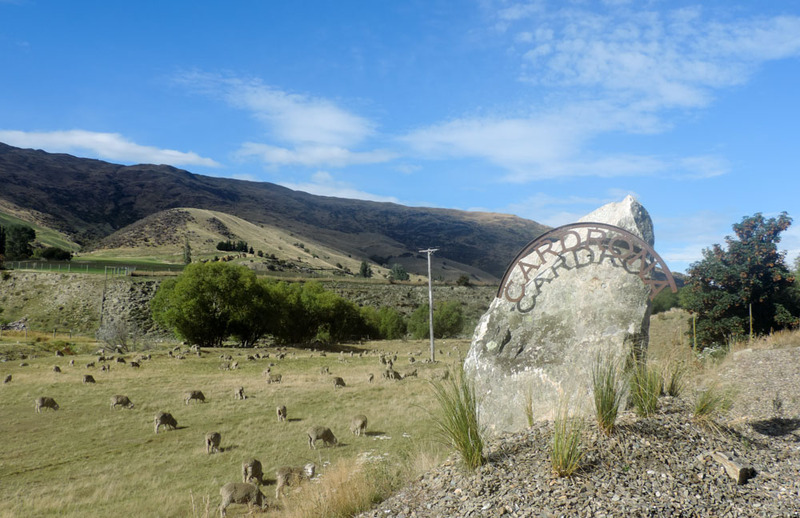 I took the opportunity to stop and take a couple of pictures especially as I am always amused by the ingenuity with which kiwis mould the environment to suit their humor. Queenstown is now somewhere behind that bump in the middle. My favourite sign, with a twist. No wonder they advise the use of low gears, the next mile is a succession of hairpins that have nothing to envy to the ones you find on the Alps on the high passes. I got almost at the bottom at break neck speed with the only regret being that I could have worn the helmet with the GoPro to get a lasting record of the ride. 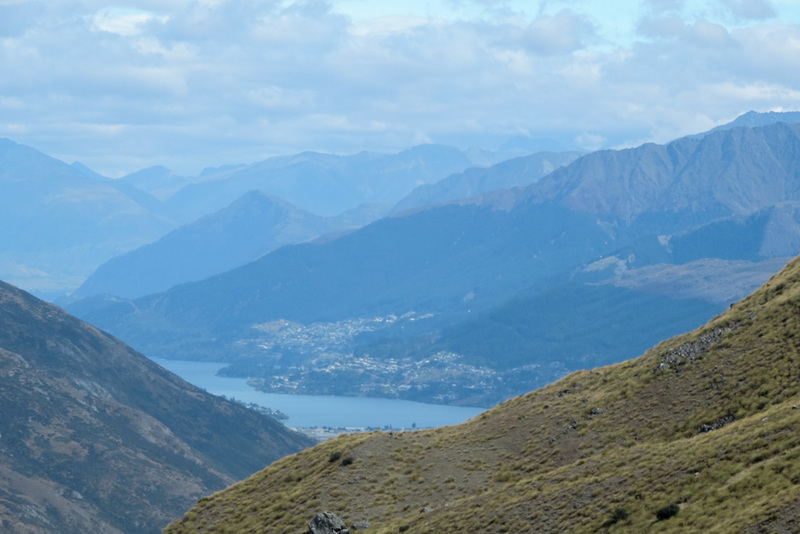 Once at the bottom it was another 10 miles to Queenstown but they went quite quickly and the names I had expected to see started to appear as a precursors to the views I was hoping to enjoy. I was pretty pleased with myself for getting to the campsite in the early afternoon. 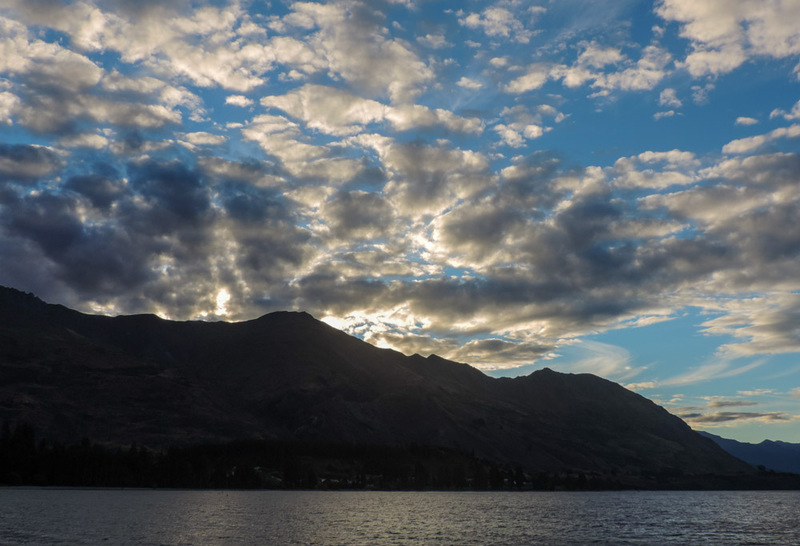 I had been thinking a lot about the two things that I wanted to do here in Queenstown, aside from getting the feel for the place, and I wanted to get them organised today. The girl at reception was extraordinarily helpful and booked it all for me so I am now the proud owner of a 15,000 feet tandem skydiving ticket that will see me through 5,000 metres of fall, of which a whole minute in free fall, over the Remarkables tomorrow, and of a seat on a fly-cruise-fly expedition through the Milford Sounds on Thursday. I had decided some time ago that I did not want to cycle to Milford as I’ve been told the road is a bit of a nightmare and you get to see much more from the sky and from the boat. Anyways, all things going well, I’lll be posting my inadequate description of the adrenaline hit I’ll get tomorrow morning, but if things don’t work the way they should, then you can come and help in collecting my pieces which no doubt will be scattered over a wide area on the mountain tops. Dai Alex, va beh che in nuova Zelanda ci verremo tutti volentieri. Ma per stare in tua compagnia.